Early spring is not too early to catch big river smallmouth bass in West Virginia. Waiting for “the water to warm up” means missing out on a great chance at catching the year’s biggest river smallies. The longer days of March and April fuel bronzeback feeding forays. The fish will move to the edges of the wintering holes that provided them cover and protection the past three or so months. When you find the right spot, you will be fishing over a large concentration of bass. Here’s a look at several excellent late winter river smallmouth options, as well as how to catch these fish at this time. According to veteran river guide Larry Nibert (www.wvexperience.com), the Greenbrier River is a good option to kick off the year’s river smallmouth bass fishing efforts. Nibert says that much of his early season efforts take place on the Greenbrier in the section starting near Anthony Creek and Caldwell Springs and on downriver. “There is a nice special-regulations section in that area,” noted Nibert. A 6-mile section of the Greenbrier, running from the U.S. Route 60 bridge near Caldwell, and extending downstream to the U.S. Route 219 bridge at Ronceverte, is under a slot-limit regulation. One bass over 20 inches may be kept, as well as bass under 12 inches. Bass between 12 and 20 inches must be released. The number of kept bass can’t exceed the statewide creel limit. Nibert points out that while the Greenbrier isn’t noted for exceptionally large smallmouth bass, that doesn’t mean the fish aren’t there. The Achilles heel of many of the state’s better smallmouth bass rivers is the presence of sections of whitewater, which creates access issues for folks lacking the experience and gear necessary to safely float them. But this isn’t an issue on much of the Greenbrier. Nibert says the Greenbrier, upriver of Alderson, is ideal for floating in a canoe, kayak or personal pontoon boat. In regard to the type of water he’s looking for this time of year, Nibert has had his best success at the heads of backwater pools, especially if there is a mix of sand and rock along the bottom. These areas, he said, tend to hold the most pre-spawn smallmouth bass. Access to the Greenbrier River is excellent. In addition to the obvious spots near bridges, the Greenbrier River trail runs along 79 miles of the river valley in Greenbrier and Pocahontas counties. “It makes it easy to jump on a mountain bike and peddle your way to some great fishing spots,” he noted. A map of the river trail can be downloaded here. Public access sites are found in Alderson, Anthony, Caldwell, I-64 Bridge, Jiffy Foam, Renick and Roncevete. Though the New River provides its challenges, the potential of catching 4-pound-plus pre-spawn smallmouth bass make it worthy of dealing with these issues. In addition to Nibert’s guide service, several other outfitters fish the New River. Nibert said a common mistake anglers make on the New in early spring is that they assume they should avoid fishing it when it’s running high and dirty. Late winter and early spring flows commonly reach 12,000 to 15,000 cubic feet/second this time of year, rates that commonly repel anglers. When the water is just coming out of its wintertime cold, Nibert concentrates on slow pools featuring gravel beds and sandbars. As things begin to warm up, and the fish begin moving toward potential spawning sites, he’ll find them concentrated in spots downstream of islands, huge boulders and river bends that provide protected water for reproduction. Though anglers float fishing the New River with professional outfitters have the best shot at catching numbers of big smallies, the fish are available to bank anglers as well. Nibert says one of the best shoreline access areas is at the Glade Creek access near Prince, off of state route 41. Other public access areas within the New River Gorge include the Hinton Visitor Center on Rt. 20 bypass; Tug Creek Beach, Brooks Falls, Hellems Beach, and Sandstone Falls via River Road at Hinton; Meadow Creek; McCreery, Grandview Sandbar, Mill Creek, Dun Glen and Stone Cliff near Thurmond; Cunard; and Fayette Station. Some spots are located within the New River’s catch-and-release area, a 12-mile river section flowing from the I-64 bridge near Sandstone down to the Grandview Sandbar access near Quinnimont. Bank anglers should also use caution when fishing this volatile section of river. One needn’t journey to picturesque valleys such as those that contain the Greenbrier and New rivers to catch early season smallies. Though the industrial nature of the Ohio River isn’t as aesthetically pleasing as the former waters, the upper portions of the mighty Ohio contain some nice smallmouth bass. According to Curt Wagner, who serves as an Ohio River DNR fisheries biologist, this border water does indeed offer some late winter/early spring smallmouth bass action, particularly from the vicinity of the Hannibal Locks and Dam near New Martinsville up to the Pennsylvania line. “The recurring story within this river section is smallmouth bass within the tailwaters areas,” said Wagner. These dams include Hannibal, Pike Island and New Cumberland. “Within the Pike Island tailwaters, for example, there’s excellent rocky structure that stretches for about a mile down the Ohio side of the river,” he added. Resident anglers from both Ohio and West Virginia can fish either side of the river with their resident license. This includes tributary waters up to the first riffle. The reciprocal agreement does not extend to non-resident anglers. A good example of this situation is where Fishing Creek enters the Ohio in New Martinsville. Other notable ones include Yellow Creek and Cross Creek on the Ohio side, and Buffalo Creek in West Virginia. Industrial and municipal discharges often introduce warmer water to the river proper, which attract baitfish and bass. Boat anglers in particular should be on the lookout for such spots. A river long past its period of dreadful pollution, the Mon River has played host to a productive bass fishery for at least two decades. While largemouths and spotted bass are also present, smallies are the most abundant black bass in this river. Like the Ohio, the Mon is an impounded, industrial river. Much of the best fishing action takes place in the areas downriver of the locks and dams, and near the mouths of tributaries. This is particularly true during the springtime, as some of the best spawning habitat is found within these vicinities; smallies will begin moving into them soon after the water begins to warm; the big, pre-spawn smallies are often the first to show up. There are three lock and dam facilities on West Virginia’s portion of the Mon. They are the Opekiska, Hildebrand, and Morgantown. The shoreline section from the Morgantown lock and dam down to the mouth of Decker’s Run is a good spot to check out. In Marion County, public access sites are found at Fairmont and Prickett’s Fort. Launches in Monongalia County include Morgantown, Star City and Uffington. Comparatively speaking, West Virginia has a small portion of this storied river. But not all of the Shenandoah’s smallmouth bass fishing is found in neighboring Virginia. The portion that flows through the Mountain State also provides sport worth pursuing. 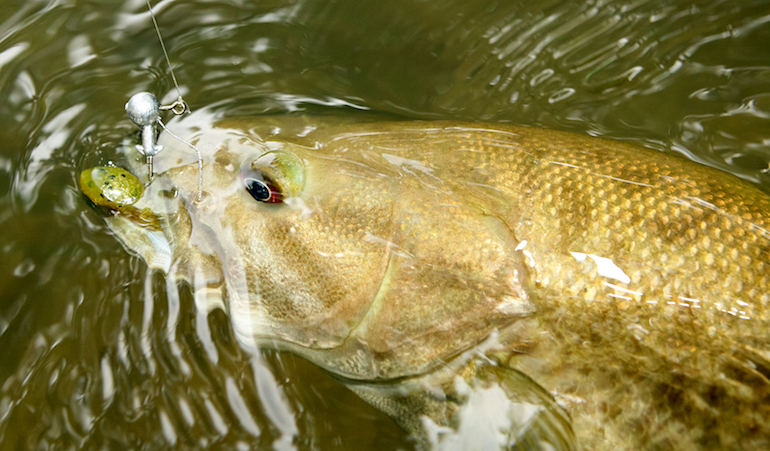 Much of the attention on the Shenandoah during the early part of the decade was in regard to fish kills affecting several species, smallmouth bass included. Recent years have witnessed a remarkable comeback by the smallmouth bass population, with several strong year classes present. West Virginia public access areas to the Shenandoah, in Jefferson County, include Bloomery Bridge, Harper’s Ferry, Millville, Potomac Edison (both above and below the dam), and Shannondale Springs. Not surprisingly, in water temperatures barely on the plus side of 40, one of the keys is slow bait movement. Whether you are fishing a bait that drags along the bottom or one that rides higher in the water column, it’s important to barely crawl it. Bread-n-butter bottom baits include tubes, bucktail jigs and twister tail jigs. Though tubes are often fished via an insert-style jighead, another good option is to Texas rig them using a wide gap hook and a bullet-shaped slip sinker. A 2/0 or 3/0 hook couples well with a 3-inch tube. When a rocky bottom is eating jigs, the T-rigged tube is often the answer. Bass tend to move to the edges of a hole when they are feeding, which can be up against the bank, or on shallow flats either above or below a deep hole. Suspending hard-bodied jerkbaits are another option, especially when the water is clear. Work the bait in a twitch-pause manner, allow it to suspend for several sections of the pause, which is when most bites happen this time of year.